Following on from my last example of copying a SSH public key to a remote computer, this is something I need to do when setting up a new computer. Setting up private/public keys for SSH just make logging in that little bit smoother. When you need to rerun the command, you need to load it up, edit it and resubmit it. Unfortunately (although it’s probably possible) I don’t know an easy way to bring up a previous command and edit it in-line so that I can send it again without actually sending the command again before doing so. Instead, Load a variable into the command line and change it next time. 440  cat ~/.ssh/id_rsa.pub | ssh madivad@$remote "mkdir -p ~/.ssh && cat >> ~/.ssh/authorized_keys"
cat ~/.ssh/id_rsa.pub | ssh madivad@$remote "mkdir -p ~/.ssh && cat >> ~/.ssh/authorized_keys"
For example, in the above session, for simple commands, I would being the history file up, reissue line 440, then edit, then issue it again. In this situation, it would have the effect of loading the key again, and that’s not what I want to do. No password was needed, the command was a success. This could be done with other things as well where you’re always changing one element on the line (or multiple elements, and use multiple variables). Instead of typing the whole line next time, I can just type the new apps to install in the “upstall” variable and reissue the command (in this case, using arrow up a couple of times, or grabbing the index from the history file). byobu is already the newest version (5.106-0ubuntu1). htop is already the newest version (2.0.1-1). multiwatch is already the newest version (1.0.0-rc1+really1.0.0-1). If I then later want do another update and install something else, I can re-set the “upstall” variable and arrow up or grab it out of history. jq is already the newest version (1.5+dfsg-1). I'm a simple man, I like simplicity. And although there are probably better ways to do this, for the time being, this is how I'm getting the job done. It works well for me, but I'm open to any suggestions and/or improvements. As I said, not the best example, but hopefully you get the idea. cat ~/.ssh/id_rsa.pub | ssh someuser@someserver "mkdir -p ~/.ssh && cat >>  ~/.ssh/authorized_keys"
2016-03 line 1.2016-03 line 2.2016-03 line 3.2016-03 line 4. The hard drives are located in an external multi-bay enclosure and all hard drive LEDs are flashing away like mad. A good sign. 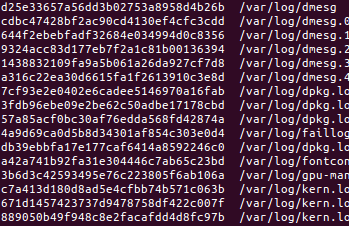 But every now and then I’ll run an ‘ls’ to see where the files are at (checking file size) or alternatively (and usually better but more resource intensive) a line count of the hash files. Given I know how many files there should be, the line count gives a fair indication of the progress of the whole process. The fact that drive1.1603 is larger is of no consequence, there are just more files to consider. After running the above check for sometime, I realised that one of the files (in this case drive1.1603) had stalled for several hours. I’m not exactly sure when it seemed to stop growing, but doing a tail of the file confirmed it was stopped. The last output was an inconsequential .DS_Store file roughly 6K in size. After physically monitoring it for some time I began to get concerned about this. I could see the all 4 RAID drives getting activity, but nothing was being recorded. The 5th drive, the backup, was hashing away without a problem and the log file was growing as expected. The ‘r’ of FD with ‘3r’ signifies the file is being read for hashing purposes, and that file is a very large file that I know is around 500GB. Running the command again shows me the second file being read in had changed, yet the first had stayed the same. Given the file is very large and will take considerable time to hash and that the hard drive LEDs are flashing, I realised all was good in the world and I could move on with the days activities. Sometimes the File menu option is not available, but the keyboard shortcut CTRL + CMD + T is usually right to go. You could try dragging a subfolder into place and then ESCAPEing out of it. This will usually open up the past the re-add the folder you couldn’t add a moment ago. 2n+r where ‘r’ is the number of redundant drives and 2n+r are the total number of drives in the vdev. remove entries that are not duplicate entries. Although this could be completed in one step, I have broken it into several steps for my own clarity. I wanted the hashes in two forms, one with file sizes, and one without. I first created the hash set with file sizes and then parsed that to remove it from the front of the line. This is a lot quicker than hashing all the files twice. simply enough, I know the line commences with any number of spaces (including zero spaces), then a number that is the file size. This can only be a set of digits, and finally two spaces (unseen between the final asterisk and double slash). we need to sort the file based on two keys. Firstly, the file size then the hash.